of my travel with Rotary International’s Group Study Exchange program. It had been a long day already by the time we arrived at the hotel in Spoleto, only minutes before the evening’s program was to begin. On our side of the door, four girls were showering, dressing, and comparing notes on our second day on the Group Study Exchange Tour of central Italy. On Ron’s side, sixty or so Rotarians awaited our company at a cocktail hour, to be followed by a formal banquet and then our slide show. You could say the day had begun five months before, when I saw a headline in the paper that said “Outstanding Young Professionals Sought for Group Study in Italy.” I applied, was accepted, and found myself attending a few brief planning sessions and two weekends of Berlitz language training. 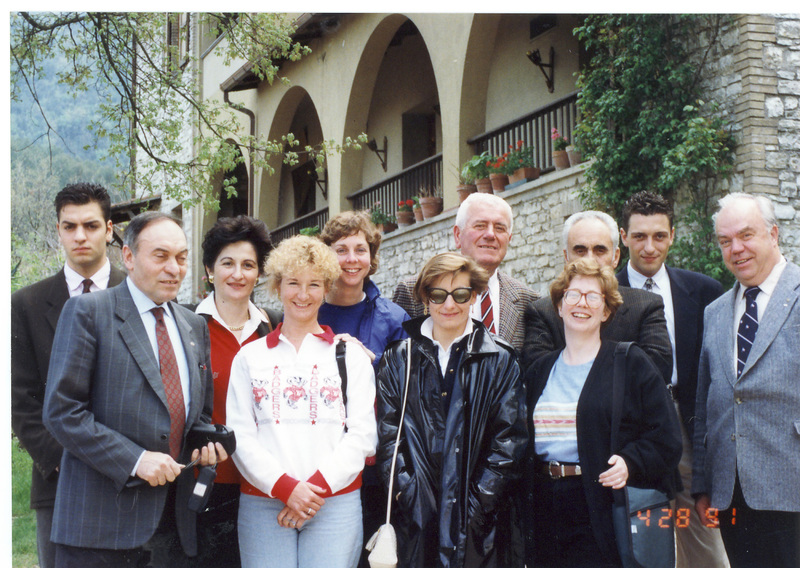 Then, off I went with five strangers to be guests of a Rotary district that covered part of Tuscany, Umbria, and several other provinces along the Adriatic coast. Our mission was to build international friendship through professional exchanges, which turned out to mean largely social hours like the one we were now dressing for. I was an entrepreneur at the time I was selected for the trip, head of my own small graphic design firm. My teammates included three other women; a journalist, a postal worker, and a real estate agent. The men accompanying us were our teammate Ron, a carpenter packaged in six feet of hard-bodied good looks, and our leader Bruce, an odd baby of a man, as soft as Ron was hard. Each day for the next month would begin like this one: Wake in someone’s guest room; join hostess for coffee; fumble for words to share pleasantries; attempt to find out the day’s program, so as to choose something appropriate to wear; board a mini-bus: join teammates, leader and hosts; and head off to do whatever the Rotarians had planned for us. This particular day began with a tour of a printing plant. Next came a stop at the highest waterfall in Italy. Enticing hiking trails led away from the roadside toward the tumbling water, but we had no time (and the wrong shoes) for that. Our hosts insisted we move on over the mountain toward Spoleto. On the way, we stopped to tour an Olympic training village. After lunch we were driven to a roadside gas station for the first of many hand-offs from one club’s members to the next, who brought us to this hotel in Spoleto. On that ride over the mountain, we grabbed precious moments with the translator, who helped us convert our slide show script into Italian, and practice reading it. Before our departure, my teammates and I had assembled a presentation about Wisconsin and our lives here. Photos from the Wisconsin Tourism Department gave it a polished opening, which soon devolved into snapshots of our families, homes, and workplaces. Ron knocked again. “Now!” We came downstairs to find a crush of men, with among them a very few of their wives and even fewer business women. We tried our newly learned Italian phrases as the cocktail party segued to a dinner, and then the plates were cleared fo the slide show. Somehow I was selected as narrator of the opening segment. The greatest hit was the image of ice fishermen, blaze orange specks among a village of shanties on Madison’s Lake Mendota. To accompany this image I read a sentence about “uomini qui cercono i peschi sotto il giacchio” – men who search for fish under the ice. But I had not yet mastered the pronunciation of fish — “peschi”—and I came out instead with “pesci” — the word for “peaches.” The audience reacted with amused disbelief. The translator quickly corrected with the word for fish, and still they laughed. “Incredibile,” this concept, regardless whether the men searched under the ice for fish or peaches. And so it went, through five weeks and four provinces of Rotarian factory tours, sightseeing, banquets, and our slide show, over and over again. Slight misunderstandings compounded like the peaches/fish confusion, as we made our way through the Rotarians’ packed and pointless itineraries. “You see why we Italians lost two wars,” one apologized, after another morning wasted in last-minute changes to the day’s plan. The same cycle of three days repeated over and over–arrive in a new community, fight for information about the plan, do the plan, leave and arrive at a new club and start all over. There were days when we felt like pampered princesses, squired around by our safe host-families, honored and toasted and written up in the local press. But it went on too long, and in spite of the Rotarians’ well-meant hospitality, it contained too many discomforts. The weeks of icy rain were no one’s fault, and neither could anyone really be blamed for the other discomfort of the trip, the devolution of our team dynamics. We girls quickly became a collective backdrop for the glorious Ron. It’s not surprising that he got the lion’s share of attention from the professional men. But his effect on the series of young women who came along to be our translators was harder to bear. Day after day, Ron would deploy a flirtatious whisper, a touch of an elbow, and before we knew it he would spirit the translator off in daddy’s Ferarri to ride horses, or visit the ocean, or who knows what. We females would be left to follow the Rotarians through whatever itinerary had been planned for us, without benefit of translation. As this scenario repeated itself we begged our leader Bruce to do something, but practically speaking, what could he do? He was no match for the manipulative Ron. Without benefit of translators, we never had a shred of information – and never a reason to need it. There was never a decision we were allowed to make. I quickly devolved from an eager recruit into a sullen, jealous child. I couldn’t let go of my expectations of meeting my professional peers to enjoy the Rotarians’ schedule of natural and man-made wonders, followed by banquets and the same cocktail party chatter over and over. Where did I come from, how did I like Italy…I began to feel like a child at a grown-up party. It’s very odd as an adult to have such a visceral experience of what it’s like to be a child. We were fussed over and then politely ignored, lied to casually, bent to others’ will. No wonder kids get cranky. I shudder to think of some of the tantrums I threw. I wish I could have enjoyed the cascade of experience. Instead I spent five weeks as a mewling infant, carried across Italy crying in my unintelligible language, “will someone please listen to ME?” Back in Wisconsin, it took a solid year for the nightmares to stop. But in a strange way, that absurd trip did contribute materially to my professional development. I began to write. First it was the obligatory report for the Rotarians’ program, then more and more words, as I processed how I felt. I wrote through the anger, into self-discovery, and beyond that to the joy of fiction as I tried reshaping the events of that trip to suit my own fantasies. The Group Study Exchange was not a comfortable process, but out of it I was born a writer. This entry was posted in Sarah's memoir and tagged Italy. Bookmark the permalink.